It is quite certain that the goat was one of the first domesticated animals in Western Asia. He is thought to have descended from the Pasang or Grecian Ibex, a species of wild goat found in Asia Minor, Persia, and other nearby countries. Old Testament verse mentions the goat more than 150 times. In Greek and Roman mythology, Pan, the god of shepherds was half goat. Capricornus, the goat, became the tenth sign of the zodiac. Capricorn is a major constellation of southern skies, and the tropic of Capricorn marks the maximum southern deviation of the sun course during the year. As of 1961, world goat numbers were 350,000,000 head (USDA figures). Among the leading goat producing countries of the world is India with 17% of total numbers, Turkey with 7%, Ethiopia 5%, Iran 4%, Brazil 3%. Goats are also found in smaller numbers in Egypt, China, Mexico, Canada, the United States and other countries. California is the leading milk Goat State in this country; Texas and Arizona are the leading Angora goat producing states in this country. Dairy goats are not nearly as numerous as dairy cattle in the United States, but, for many other countries of the world, they are the leading milk producers because they are well adapted to limited areas and require less specialized feed, most of which can be produced by the small land owner. There are actually more people consuming dairy goat products in the world than those consuming the products from dairy cattle. This is because the goat population is large in mountainous areas where they can thrive on grass and browse on brush; whereas, the limited feed in these areas will not support dairy cattle. The goat is very helpful to people in small, hilly, dry, countries. In this country, the dairy goat eats much the same feeds as dairy cattle because we have the land areas to grow these feeds. As our populations expand and there is more competition for land areas, dairy goat numbers may increase. The animals are ideal for the small rural dweller that works in the city and lives in the country. Goats make ideal 4-H and youth projects. The animals are interesting, like attention, are not expensive to buy or feed, are easily handled and transported, and are fun to show at fairs. Young people learn responsibility by having the daily care of goats. They learn about nature's processes by caring for animals and they learn citizenship, sportsmanship, and the value of cooperation and of working with others by taking part in the club program. Goat breeders are usually very willing helpers with 4-H Goat Clubs, many furnishing leadership and information to help clubs along. A good way to start is to grow into the business by starting with a bred doe or a couple of kid goats. 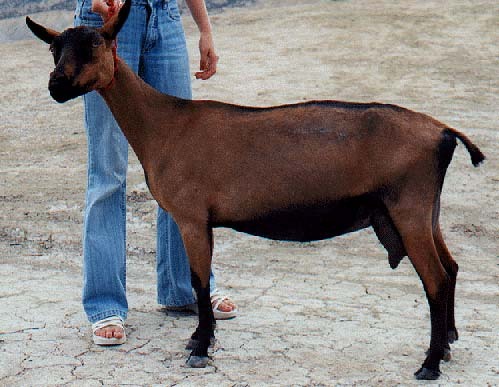 The seven main breeds of dairy goats in the United States are Nubian, French Alpine, La Mancha, Saanen, Toggenberg, Oberhasli, and Recorded Grade. Alpine (French) Considered one of the Swiss breeds but its origin is believed to be mainly Swiss and French influence. The Alpine is medium to large in size and is considered a good milker with long lactations. A good doe can easily produce 3 or more litres of milk per day over a 10 month lactation. It is a very popular breed and is adaptable to any climate. The Alpine breed has many varieties and therefore can be of almost any color or combination of colors. LaMancha Recognized as a separate North American breed developed in California, but its ancestors are believed to be of Spanish origin. Very small ears are their most outstanding characteristic, sometimes called gopher or elf ears with gopher being the most desirable. Small ears are genetically dominant and will be passed on in the offspring of any buck with gopher ears. The La Mancha is of medium size but is very strong and hardy and well suited to Newfoundland or Canadian conditions. They make excellent dairy animals but produce a little less milk than the Swiss breeds. A good La Mancha doe, however, should average 3 litres of milk per day over a 10 month lactation. Any color or combination of colors is acceptable to the breed. Nubian This goat was developed in England mainly as a dual purpose animal, i.e. for milk and meat. English Swiss type does were crossed with bucks from Eastern countries such as India, Egypt and Ethiopia. Any color or combination of colors is acceptable and the breed is characterized by its Roman nose and long, wide pendulous ears. The Nubien is the most popular breed in North America today and multiple births of 3 and 4 kids are common. The Nubien is also more heat tolerant and less cold tolerant than Swiss breeds which may have something to do with its pendulous ears. They tend to be more out of season breeders than Swiss and therefore provide winter milk more easily. They are also favored by buyers who purchase for meat because of their meatier carcass. Milk production is a little less than Swiss breeds but a good Nubien doe can average 2.5 litres per day over a 10 month lactation. Oberhasli The Oberhasli is a Swiss dairy goat. This breed is of medium size, vigorous and alert in appearance. Its color is chamois. Does may be black but chamois is preferred. Chamois is described as: Bay - ranging from light to a deep red bay with the later most desirable. A few white hairs through the coat and about the ears are permitted. Markings are to be: two black stripes down the face from above each eye to a black muzzle; forehead nearly all black, black stripes from the base of each ear coming to a point just back of the poll and continuing along the neck and back as a dorsal stripe to the tail; a black belly and udder; black legs below the knees and hocks; ears black inside and bay outside; bucks often have more black on the head than does, black whiskers, and black hair along the shoulders and lower chest with a mantle of black along the back; bucks frequently have more white hairs through the coat than does. 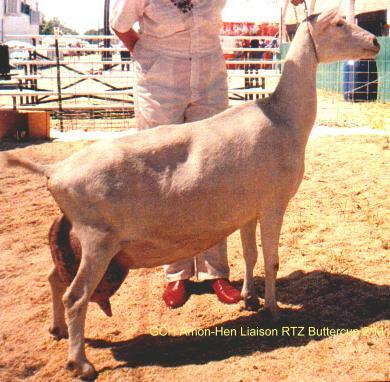 Saanen Considered the Holstein of dairy goats because of its superior milk production and is also the largest of the dairy goat breeds. An average doe should produce 3 litres of milk per day over a 10 month lactation. The Saanen is also a Swiss breed and animals are white to light cream in color. They are also very adaptable and can do well in almost any environment. They excel when fed on high quality roughage and concentrate. The Saanen holds the world record for milk production with 3028 kg. in 305 days. That is an average of approximately 10 litres of milk per day over a 10 month period. Toggenburg Considered the oldest and purest of Swiss breeds and once the most prominent of all dairy breeds in North America. They are the smallest of the five prominent dairy breeds in Canada and are also noted for their hardiness and adaptability to all climates. Their coat can be any shade of brown from light fawn to dark chocolate. A good doe should have no problem averaging 3 litres of milk per day over a 10 month lactation. In fact Toggenburgs are noted for their longer than average lactating period although their butterfat tends to be a little lower. A good doe can easily produce 4 to 6 litres at her peak of lactation. Recorded Grade A cross of any two breeds. Female goats are does and male goats are bucks. The young are called kids. 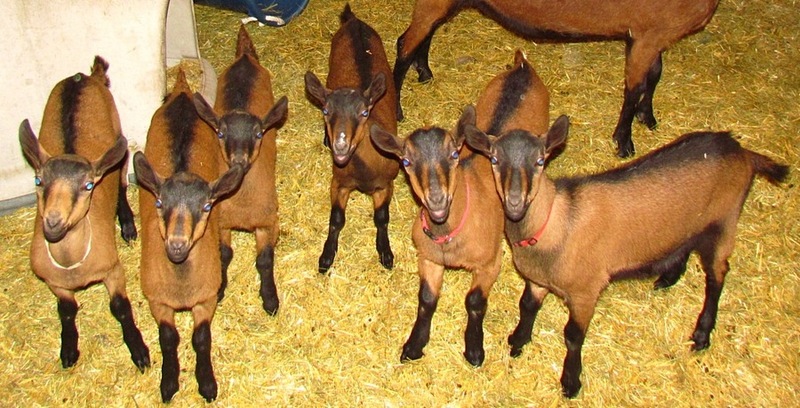 Goats are herding animals, and for their benefit the prospective goat herder should start with at least two animals, e.g., several doe kids or milking does. A buck can be added at a later date. Goats can be kept on one acre of land or even less. Access to browse plants (shrubs and trees) provides necessary roughage in the diet in addition to shade. They are fed twice a day, usually on a diet of alfalfa or clover hay supplemented by a ration of commercial grain feed high in protein. Loose housing, like a loafing shed, is acceptable as long as the animals have a dry, draft-free place to rest during the cold, inclement weather. Stout fencing is very important, since goats are curious and enjoy exploring their surroundings. Of all types of livestock, goats are probably the most intelligent. They form strong, emotional bonds with the goat herder, and therefore make wonderful pets for both adults and children. Visit herds to see all the dairy goat breeds, then decide which one is for you. Consider the pros and cons of buying a kid, dry yearling, or milker. Visit goat shows, ADGA or local club meetings and ask lots of questions. Taste the milk produced at the herd you are considering buying your goat from. Prepare a safe, sheltered, ventilated pen, plus an exercise yard and/or safe pasture. Dog-proof fencing should be used to enclose the pasture and poisonous plants (milkweed, sheep laurel, black cherry, and nightshade) should be destroyed. All dairy goats purchased should be disbudded. Ask for recent CAE testing results and a Caseous Lymphadenitis vet check before purchasing your animal. The Dud. Buy from someone you trust. If you lack close friends who raise goats, join your local goat club and make several. Do NOT buy a goat from a stranger. Dogs. All goats want out. Two want out less than one, so buy two. Electric fences keep goats in but they will not keep dogs out. A half-dozen miniature poodles can kill an adult goat if they gang up on her. Install good tight woven wire fences 4 1/2 feet high, and do not let your own dogs out with your goats unsupervised. Extra Baggage. Bucks and horns on your goats do not belong in the novice goatkeepers's herd, and the reasons are pretty apparent. The former are a lot of trouble, and the latter are dangerous. Also, pet goats (wethers, old does, and cripples) have a way of multiplying. If you're too softhearted to eat your pet wether, sell it to someone who is not. You would not keep a pet steer, would you? Be sensible and try some chevon. Biting Off More Than You Can Chew. It is a poor idea to practice on a milking doe. For your first goats, a couple of young doelings would be ideal. By the time they freshen you will have learned a lot about them. Take it slowly and do not let your enthusiasm get out of hand. Illness. It can not be avoided entirely, but those who practice preventative medicine have less, and it is less serious when it does happen. Ask your veterinarian what vaccines and wormers he/she recommends, and ask some breeders about vitamin-mineral supplements, management tips, etc. If you start with good stock, vaccinate regularly, feed correctly, and are quick to notice changes in appearance and habits, and seek help, serious illness will be rare. Economizing on Feed. Don't. Buy only the best hay you can get of a type recommended by people who raise dairy goats in your area, and feed as much as your does want. Stick to a grain formulated specifically for dairy goats. Find out how much grain to feed according to milk production needs. If you do not, your goats will be unhealthy and will not produce milk economically. Lack of Preparation. Do not get caught short. Find out from experienced hands what you will need in the way of feeders, buckets, strainers, veterinary supplies, etc., and have it all ready before you need them. Ignorance. It cannot be totally avoided. You can, however, get past the awkward novice stage rapidly and with a minimum of pain. Join your local goat club and go to all the meetings. Visit dairies and breeding farms and ask lots of questions. Go to shows. Get to know your veterinarian. Listen. Watch. Buy books and subscribe to magazines. How fast you learn is up to you. Experimentation. Until you have had a lot if experience, leave this to wiser hands. A dairy animal is a very complex mechanism and the slightest error in feeding or management can have serious results. Just to give an example, both too-fat and the too-thin doe are susceptible to Ketosis, a very nasty disease that kills a lot of goats. Follow your vet's orders, and read all of the many fine books and magazines you are collecting. Goats are usually very healthy, except for a few digestive problems. Systems of illness are listlessness, lack of appetite, diarrhea or scours, bloat, coughing or sneezing, runny nose, runny or inflamed eyes, fever or just plain "blahish" or acting more quiet or different than usual. Lack of weight gain or weight loss may indicate illness or perhaps a heavy load of parasites. If given proper feed, regular vaccinations, routine worming and plenty of exercise and sunshine your goats should stay relatively healthy. Following are the most common problems encountered. CAE: (Caprine Arthritis Encephilitus) A disease caused by a virus and transmitted to kids through the mother's milk that causes inflamed joints, lameness, and death. Goats can be carriers of CAE and not show signs of the disease. It can be detected only with a blood test and when buying goats it is wise to ask if they have been tested for CAE. In active cases you will note from slight to severe swelling in the knees and other joints. Goats may show nervous signs such as twisting the head from side to side or being unable to stand. No treatment or vaccine is currently available for CAE. ABCESSES: (Caseous Lymphadentitis) CL is a bacterium that affects both sheep and goats. Leave an abscess alone until lit is ready to lance. CL abscesses spread easily and you must take care not to contaminate pens, pastures or grounds. This disease is extremely contagious to goats. A goat that gets frequent, reoccurring abscesses should be culled from your herd. The animals can have internal abscesses as well and the milk is not safe for human consumption. A vet check is needed to be sure an animal does not have CL. There is no vaccine approved for goats at this time. Goat milk is nearly always pure white in color. The small size of the fat globules and the soft curd are its primary characteristics. Because of these qualities, goat milk is often recommended for infants, pregnant women, people suffering from liver disease, allergies or ulcers, and anyone else with digestive problems. Goat milk is healthful, nutritious, and flavorful. To the surprise of many, goat milk tastes no different from whole cow milk. A main difference is that goat milk digests within twenty minutes versus an hour or more for cow milk. It also contains desirable amounts of nicotinic and pantothenic acid, riboflavin, thiamin, and niacin, It has an alkaline reaction as opposed to the acid reaction of cow milk which helps to soothe your stomach. The lactation period of the milking doe is 305 days. During this period, the average doe in the herd will produce 1500-1700 pounds of milk, or about ½ gallon or more per day on average. Some cheeses made from goat milk include cottage cheese, Neufchatel cream cheese, Coulommier, French Roquefort, Norwegian gjetost, Greek feta, chevre, and numerous other soft and hard cheeses. Excellent yogurt can also be prepared from goat milk, and dairies equipped with a cream separator can produce a very tasty butter. The art of cheesemaking can be exciting and fun. Understanding all the ingredients and how they work will help simplify this process. You can make cheese at home and many other things as well. Real savings can be realized when you no longer need to purchase those items from the store. All cheese is basically milk, cultures, salt, and rennet. What makes one cheese different from the others is the temperature the milk is heated to, the type of culture added and the way it is processed. Temperature, humidity, rennet, cultures and whether it is eaten fresh or aged will determine the type of cheese you will have. Milk is the most important ingredient in cheesemaking. It is important when making cheese to be as clean as you can. Milk is a perfect medium for growing bacteria. Good or bad! Make sure your pots are clean and dry. You will need a stainless steel or unchipped enamel pan, a thermometer for taking temperatures, a long knife for cutting curds and a strainer. The following recipe is an easy, soft-cheese recipe you can try at home. Start with one gallon of goat milk. Bring the milk rapidly up to 180 degrees for 5 minutes. Keep an eye on it to make sure it doesn't scorch. Stir in ¼ cup of vinegar diluted in ¾ cup if water. Soft curds will begin to form almost immediately. Stir for about 5 minutes and then pour into a strainer lined with a good quality cheesecloth. Add whatever herbs and spices you desire and non-iodized salt to taste. This cheese may be made into a ball and rolled in dried parsley or nuts. Chill and enjoy. Goat meat, or chevon, is delicious stewed, baked, grilled, barbecued, or made into sausage or jerky. It is low in fat and cholesterol and a flavor somewhat like venison, but does not have a gamey taste. Eaten young, it is similar to prime veal, as the animal matures the meat becomes more like a beef/venison cross. Goat meat is 50-60% lower in fat than similarly prepared beef, but has a similar protein content. USDA has also reported that saturated fat in cooked goat meat is 40% less than that of chicken, even with the skin removed. Out of three exotic meats (venison, rabbit, and goat) sold in New York City, goat is the lowest in cholesterol.